Theories about extraterrestrials have been used for entertainment as far back as movie cameras have been in operation, sometimes being so relentlessly exercised that the novelty of the concept quickly and easily becomes just another cliché in most modern motion picture circuits. In the literal dawn of mankind's space exploration, however, concern with movie formula is traditionally suspended because of the countless unanswered questions that continue to result from our uncertainty, and audiences continue to flock to the multiplex in search of new ideas and assumptions on the topic. As fascinating as it all may be, however, we still can't forget that movies are not always the most accurate reflections of reality, either; although there is much room to speculate on what exists beyond the Earth's atmosphere, especially in art, there is only so many times an idea can be twisted and reshaped before it begins to lose its elasticity. In most regards, you have to admire director M. Night Shyamalan's zealous gesture with "Signs," a film that is being pitched to the viewer as a thriller with a focus on visitors from unknown worlds. There is a solid conviction rooted deep within this particular endeavor that is seldom seen in most alien-fueled flicks, one that embraces unique strategies without abandoning logic or reality in the grand process. While the result is never quite as original or potent as Shyamalan hopes it will be, it has the distinction of being one of the few films in the recent past to slightly challenge and contort this rubik's cube of a concept. That may not be enough to earn the trust of every moviegoer, but it's enough for me. What is most astonishing about "Signs," however, has nothing to do with how it dodges and deflects the obstacles of its subject matter. The movie is a surprisingly well-made and thoughtful excursion into multiple territories, conducted as a deep psychological thriller with just minor brushes of the obligatory science fiction elements. This isn't a film about an all-out war being waged between the human race and its unknown opposition; it's about the paranoia and fear of such a scenario as it begins to configure itself in the minds of nonbelievers. Shyamalan's vision does not necessarily want to make decisions about extraterrestrials, either; in his mysterious and ambiguous atmosphere, distinguishing details about the aliens themselves are sketchy at best and generally avoided (with brief exceptions during crucial plot twists). He knows that visitors from other worlds are only as disturbing as the viewers makes them, and on those grounds the picture is a minefield for numerous plausible interpretations. During the film's calm but generally slow opening act, we meet up with the secluded and simple Hess family, a group of farmers in a rural Pennsylvanian community who are the target of a mysterious occurrence. Graham (Mel Gibson) is the family's center, a former church minister whose wife was killed in a car accident a couple of years before. His brother Merrill (Joaquin Phoenix) is a skeptical man and former minor league baseball star; his son Morgan (Rory Culkin) is fascinated by things out of the ordinary, and his daughter Bo (Abigail Breslin) is a mysterious young being who is extremely picky about the quality of her drinking water. 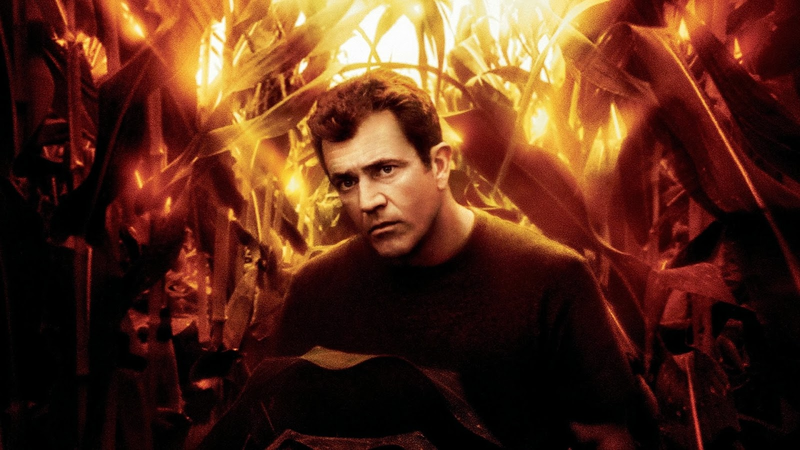 In the movie's opening shots, the family is drawn to the large cornfields just beyond the farmhouse, where countless crops have been flattened to create large and ominous shapes from views high in the sky. Local law enforcement and Graham all assume that these findings are all the result of a prank from teenagers in the local area, but the puzzling thing is that each and every stalk of corn is snapped at a precise point and laid down in a constant direction without any further damage, which makes the odds of city kids pulling a hoax very unlikely. Soon the news channels are bombarded with reports of these mysterious "crop circles" showing up in different areas of the globe, appearing so rapidly and densely that worldwide concern and wonder begins to escalate. Graham tries repeatedly to keep his family out of the loop on these details because he doesn't really believe them himself, but new evidence continues to fall at their feet at an alarming rate: trash cans are invaded by unseen and swift shadows, sounds are emerging from the corn fields, and the old family baby monitor is picking up frequencies that reveal some kind of alien-like communication. Without giving too many specifics away, the family's sense of security begins teetering on the edge of complete meltdown as these details slowly build,, and once their fears are realized by the impending doom of the world around them, they find themselves struggling for their own survival. Generally speaking, Shyamalan's skills as a moviemaker have been questionable up to this point, as his first two screen efforts—"The Sixth Sense" and "Unbreakable"—have lacked the necessary substance to complement his constantly-observant approaches. With this subject matter, he has finally found something to suit his quiet but intriguing style, a premise that has been in search of someone whose simplicity could breathe new meaning into its message. 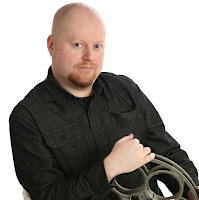 There is, however, still a few kinks he needs to work out behind the camera; more often than necessary, for example, his subtlety as a thrill-driver, although responsible for quite a few effective shocks during the movie's middle act, can have the unfortunate outcome of being dry (particularly during some of the early dialogue exchanges). None of that should matter compared to the strengths, though; the movie's script is tight and well-established, the brilliant musical score evokes the nostalgia of the great chords from the Hitchcock classics, and its characters are written with enough stability and compassion to reach the audience's emotional core. If you look at "Signs" as a whole package and not on individual terms, then the result is a worthwhile and thought-provoking experience.